Colin Farrell struck a pose on the carpet this evening(March 21st) during the 'Dumbo' premiere at The Curzon Mayfair in London. 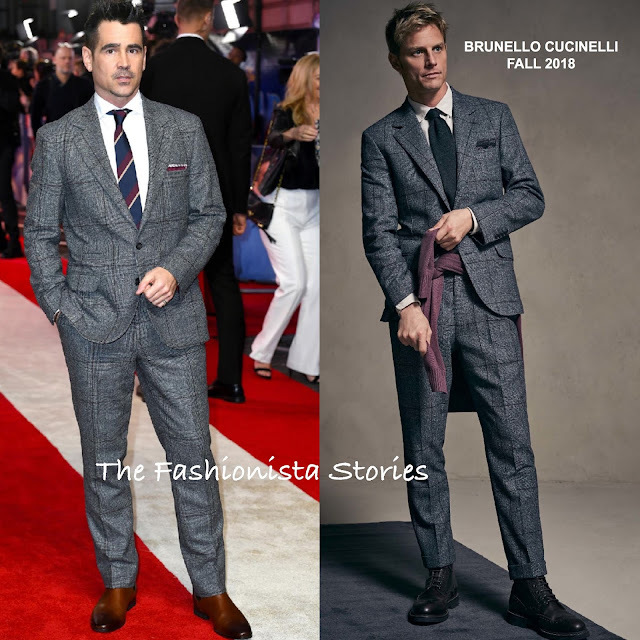 The actor was styling in a BRUNELLO CUCINELLI FALL 2018 grey two-piece suit which her paired with a white button down shirt, a burgundy, navy & ivory stripe tie, and a burgundy pocket square. The tie and the pocket squared saved this suit from coming across as boring and safe. The pants could have been hemmed a tad better but he still was sharply styled. Brown Chelsea boots topped off his look.